What is the Basis of Purchase of Ready Mixed Concrete? During ordering concrete in ready mixed form, it is important to know the basis of purchase. As concrete is a costly materials, purchaser should know how he could receive accurate and quality concrete with right quantity. Now we will learn basis of purchase of ready mixed concrete in this post. In one word, we can say the basis is cubic meter or cubic yard of concrete. The concrete must be in unhardened, freshly mixed, discharged from the mixer or other hauler system. Now we will explain what should do to measure volume. We have to know how to determine the volume for which the manufacturer provides bills to purchaser. Now question is how mass of particular batch can be calculated. This is simple. ASTM test method C138 provides test procedure for determining concrete mass for volume unit. In this method, a container of 14 cubic liters (1/2 cubic feet) is used for sampling. The result is taken as an average of three samples at least. ASTM practice C172 provides procedure to collect sample from truck load. Each sample (out of three) is recommended to take from midpoint of respective truck load. Dear reader notice that we have said unhardened concrete is used to measure the purchase volume. The volume of hardened concrete is found often lesser than that of unhardened fresh concrete. 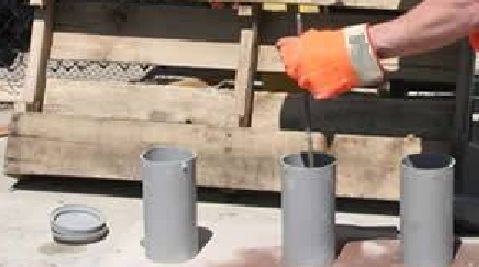 Spillage, wastage, spreading of not well stiffened formwork, loss of entrained air voids and in case of foundation concreting or concreting over ground-over excavation causes loss of volume of hardened concrete.